Children below 3 years will be our guests, less than 5 years will be @ 50% of the tariff (will have to share accomodation with parents), above 5 years will be at full tariff. The tariff offered is applicable on twin sharing basis, single room occupancy shall be at extra cost. If the number of participants of the trip is less than 8, then the cost of transport will increase nominally and you will be required to pay for it. All transfers and transport from Manali to Manali. Breakfast and Dinner on all days (Evening snacks and lunch as well if we are near Taurus at that time). Drinking water with meals. One bottle per person of filtered water apart from that(We want to minimize water filtered water wastage during the trip). Any permits if needed at any stage (as of now Indians don’t need any permits). Expenses of all kinds related to medical emergencies. Any delay caused by landslides, technical breakdown, political upheaval, poor health, and this incurring extra cost. The Spiti Valley is a hidden treasure tucked away in the folds of the high Himalayas - It is the ultimate pristine getaway where you can reconnect with your inner self through the joy of natural beauty. Sharing this joy with your companion will bring out the best in you and will rejuvenate your soul and recharge your reserves of energy …… the best in the business is at your service – the Taurus the Luxury Overland Truck – one of its kind in the world! The Pin Valley of Spiti is home to the few surviving Buchen Lamas of the Nyingmapa sect of Buddhism. With windswept vast open landscape of the valley and mud-houses with traditional architecture of the tiny villages fascinate any soul. One wonders what brought humans there at such a godforsaken place centuries ago when survival was extremely tough in such wilderness. Spiti has been long overlooked by travellers while being in a rush to Ladakh; this wild and wonderful area gift of nature is finally starting to get explored by the outdoor souls. Taurus and its passionate crew invite you before Spiti becomes just another stop on the Himalayan beaten trails. We offer the most exhilarating experience in India as of now! And a holiday to enthrall your soul and rejuvenate in real terms. Starts at Manali and finishes at Manali. Size of the Group: max 10 participants. If your group is less than 10 participants then we may book rest of the seats by exercising our choice without any intimation to anyone in the group who has already booked. Suitability: Indians fit for mountain travel. No trekking involved. Food, stay, transport as per the details given for this program. Hired transport Manali to Spiti and for the drop of the group back at Manali. Transport for excursions (included) on all days in Spiti Valley. Day 1: Check-in at a hotel for transit stay for one night, twin sharing basis, with one dinner, one breakfast. Day 2: Drive in hired transport to Spiti Valley over Rohtang and Kunzum. Check-in onboard Taurus at Rangrik/ Kaza. Day 3: Visit Hikkim, Langza and Komic. Night stay and dinner in Pin Valley (a true paradise) onboard Taurus. Day 4: After morning tea, enjoy morning walks in Pin Valley. The excursion continues to Tabo and Dhankar Monastery. 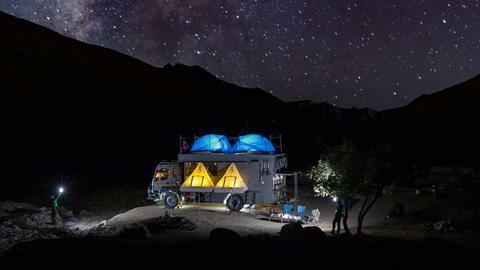 Night stay and dinner onboard Taurus at a location between Tabo and Kaza. Day 5: Visit Key Monastery, Kibber, Chicham Bridge and reach Chandertal Lake. Night stay in hired camp with 1 veg dinner, 1 veg breakfast. Day 6: After breakfast drive to Manali, stay and dinner at a hotel, twin sharing, with one dinner, one breakfast. Day 7: After breakfast, check out as per the terms of the hotel. Day 1: Arrive at Manali and check-in at a hotel for your transit stay, as per the terms of the hotel, where you will be served dinner at the hotel itself. Day 2: After early breakfast at the hotel, a hired transport (one Tempo Traveller that is mini bus to accommodate the group, if it’s of 8 or 10 participants). It’s a very exciting and adventurous drive over Rohtang and Kunzum passes, with view of gigantic mountains and mountain river and streams. Arrive at Rangrik/ Kaza and check-in onboard Taurus with basic formalities and enjoy welcome drink (it could be tea/ coffee/ local drink). Dinner and night stay on-board Taurus. Day 3: Enjoy your morning tea, which is a ritual onboard Taurus for those who love their morning tea. After breakfast, hired transport will take you to visit Langza (second highest motorable village, known as village of fossils with a huge Buddha statue overlooking the valley, probably the largest in India), Hikkim (highest Post office in the world) and Komik (the highest motorable village in Asia with a monastery). After having enjoyed the visit to these famous villages, we drive to Pin Valley while enjoying mesmerizing views. 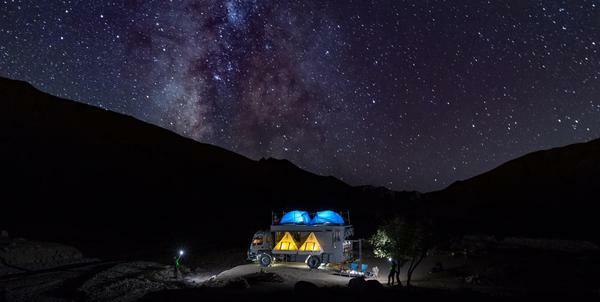 Night stay onboard Taurus in Pin Valley – a paradise in true sense but sadly not touched by most travellers who are in a rush to just tick Spiti as a ‘must visit destination’ to only brag. If time permits, walk and shopping in Kaza while returning from the excursion. Kaza is situated along the Spiti River at an elevation of about 12,500 feet (3,800 m) above mean-sea-level. Pin Valley is the cold desert landscaped by the winds and snow to go back home with memories for lifetime: You may take leisurely walks and enjoy the countryside so different that one wonders if it’s real. Night stay onboard Taurus here offers extraordinary outdoor experience for the explorers, it has no parallel as of now and beyond words. The unique kitchen of Taurus will offer hot tea and meals to keep you warm and energised. The crew of Taurus will coordinate logistics for you under the microscopic supervision of Capt Suresh Sharma as a team leader who gets involved with every small chore himself when it comes to delivering quality. Day 4: After breakfast, visit the world famous Tabo Monastery. And the same hired transport will take you to Dhankar Gompa and arrive at campsite of Taurus to enjoy your wonderful night with hot and fresh food from the kitchen of Taurus, somewhere between Tabo and Kaza. Day 5: After early morning tea, you will be served hot and fresh Indian breakfast from the kitchen of Taurus. Visit the villages Kibber (at a height of 4205 meters above sea level, holds the distinction of being one of the highest Motorable villages in the world), Chicham (the Chicham Bridge is said to be the World’s highest bridge from sea level at 4.037m / 13,244ft). The bridge is built over a deep gorge about 1000 feet high. Before this bridge the villagers of Chicham used a dangerous ropeway to cross this section. This brought relief to these villages. The new bridge was under construction for 14 years. It connects Kibber village to Chicham village. The excursion continues and your transport will take you to Chandertal Lake and check-in at a camp for the night stay. Visit the lake and enjoy the mesmerizing views of Nature at its best. Dinner at the camp. Day 6: After breakfast check-out with a feeling akin to being in ‘spiritual trance’, for homeward journey. The hired transport will take you to Manali and check-in at hotel for transit stay for homeward journey. Day 7: After breakfast at the hotel its time to check out as per the terms of the hotel. 1. This is a tentative program and may be altered to make it better and to save time for travellers at any stage with prior intimation or without any intimation. Be rest assured, we won’t ever do this to save money and by reducing the quality of the expedition. 2. Confirmation of the booking is on 100% payment. We have some SPECIAL OFFERS. 3. A comprehensive list about the conduct of the expedition, and that of participants and what to carry for the expedition will be sent later. 4. You must travel with your comprehensive insurance for medical and accidents. 5. We don’t cut corners or keep hidden costs to make the tariff as attractive illusion. Our expeditions are of quality and can’t be compared with tours around homestays and guesthouses or even hotels and resorts. 6. If tariff is the sole consideration to compare us with hotels and camps then our programs may be overlooked. What we offer at this tariff has no match as of now. We are honestly offering ‘PROMOTIONAL TARIFF’. 7. You are requested to go through all information available about the concept and terms & conditions on this website. More details on terms and conditions will be sent later. 8. We are not selling tours; we are offering a special lifetime unique experience in total comfort and nomadic style. 9. Quality comes at price. 10. There are no guarantees of any kind in remote areas where God plays major role! 11. In case, at any stage, there is any roadblock and participants have to travel to Chandigarh, instead of Manali, the arrangements will be made available at extra cost for transit stay and transport for the journey to Chandigarh or any other destination. 12. Any losses caused by any kind of delays are not the cause for any kind of compensation.